1) More than a quarter of Latinos struggle with hunger — compared to 14.6 percent of the general population, according to Bread for the World, a D.C.-based non-profit that works to end hunger in America and abroad. 2) Latino children are more likely to go hungry than their peers. While one in four American children is hungry, “child hunger is even more prevalent among Latino households — one in three Latino children is food insecure”, according to Vicki Escarra, president of Feeding America, a non-profit working to help America’s hungry through a national network of food banks. 3) Nearly 60 percent of Hispanic families with young children receive food from a program called Women with Infants and Children (WIC), according to the National Hispanic Leadership agenda, a nonpartisan association of major Hispanic national organizations and leaders. 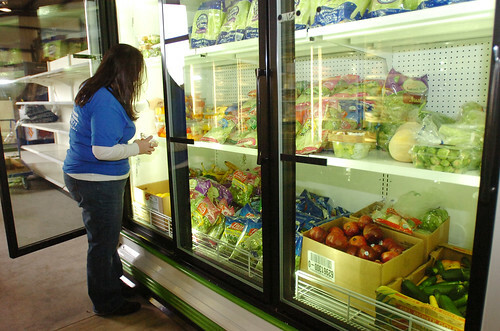 WIC provides low-income women and their young children access to nutritious foods, education and other resources. 4) A third of Latino kids use emergency food service programs. The 2010 Hunger in America study conducted by Feeding America found that one out of every three Hispanic children received services from their national network of emergency food providers or food banks. 5) Almost half of all eligible Latinos do not receive food stamps, according to the National Council of La Raza, the largest national Latino civil rights and advocacy organization in the United States.That may be because applying for food stamps, formally called the Supplemental Nutrition Assistance Program, can be complicated, according to a brief from the Urban Institute; “it is possible that Hispanic families more often than others find SNAP inconvenient because they are more likely to be working, as many SNAP offices are open only during regular work hours”. ← Capital Bikeshare Expansion: Who Should Get New Stations? “Almost half of all eligible Latinos do not receive food stamps” because we don’t sit on our @sses waiting on government handouts! La Raza doesn’t represent The Race if it wants to double the number of Latino food stamp recipients, they sound more like the White Liberals that have decimated the African American population the last 45 years. The woman in the photo is fat. Might help your cause if you had a skinny person there gazing at the food. Liberationtheology, it is a myth that hungry people are necessarily skinny. There is a large body of evidence showing that obesity and carb consumption are linked. And it is also well known that not only do carbs (bread, grains, corn, potatoes) cause weight gain — they are cheap, subsidized by our government and promoted as food for poor people. So do not blame a financially struggling person for feeding him or herself the most affordable food possible. Our government policy needs to change. Not only does high consumption of carbs make people fat and diabetic, but it makes people hungry. Carbs do not satisfy hunger. Fat does. If people get their minds woken up, then they might realize this: eat more eggs, meat, fish and vegetables, and give up the grains. Then you will be healthier, lose weight, stop being diabetic, etc. Yes, we have been misinformed about this, but we also owe it to ourselves to inform ourselves of the truth, so that we can actually end hunger.